Unless you’re doing some kind of performance art piece or are—not that I would know anything about this one—looking for an excuse to make your habit of constantly talking to yourself seem less weird, you probably want viewers when you stream. Twitch just added a new tag system that’s supposed to help facilitate that, but streamers aren’t entirely on board with it just yet. It is, on paper, a more consistent system than communities’ haphazard mishmash of often-redundant custom groupings, but many streamers say they miss the flexibility—not to mention the specific communities they built. “The tags are not good to me, the communities were better,” said streamer Taichi85. He explained that he was an admin for a community of six Italian streamers and that it was the only way for potential viewers to recognize them as a unit, because stream team functionality—which can serve a similar purpose—is only available to Twitch partners. Now there’s an Italian-language tag, but nothing that recognizes the community Taichi85 helped create. The tags Twitch rolled out with, she said, are too generic. “What little diversity was on Twitch is now way harder (damn near impossible) to find,” she said. In her eyes, Twitch’s decision to universally pave over communities with tags displays a fundamental misunderstanding of how people used communities in the first place. Twitch is currently taking suggestions for new tags and plans to add more variety to the system on a monthly basis. For now, though, some streamers feel like they’ve been left out in the cold. While the tag system does include specific genres, they only point to pages populated by particular games, not individual streams. The lack of stream-specific genre tags has been a big sticking point for some streamers. Others who play more obscure genres like simulations and 4X strategies have expressed similar, even more urgent concerns. 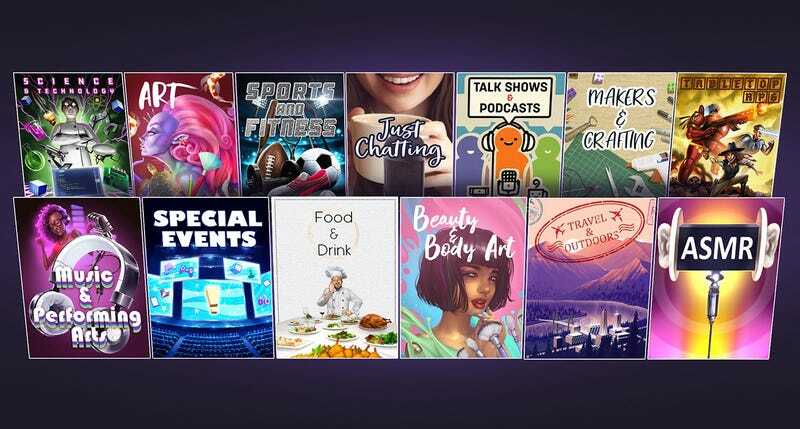 Artsier streamers, who now have a bunch of new tags to work with beyond blanket categories like “creative,” are also approaching the change with trepidation. Twitch partner MeowSparky pointed to the fact that, with creative activities broken into smaller sub-sections like “art,” “music & performing arts,” and “makers & crafting,” they’re now buried by games that individually pull significantly more viewers on Twitch’s monolithic categories page. To find them, you now have to do some digging. There is, to Twitch’s credit, a “non-gaming” tag that appears beneath all non-gaming categories, so you could conceivably click it from the icon of a more popular section that does appear near the top of the categories page like “just chatting” and then find creative streamers from there. Still, that’s pretty roundabout, all things considered. And of course, a new, more standardized system means trolls are having a field day while Twitch works out the kinks.